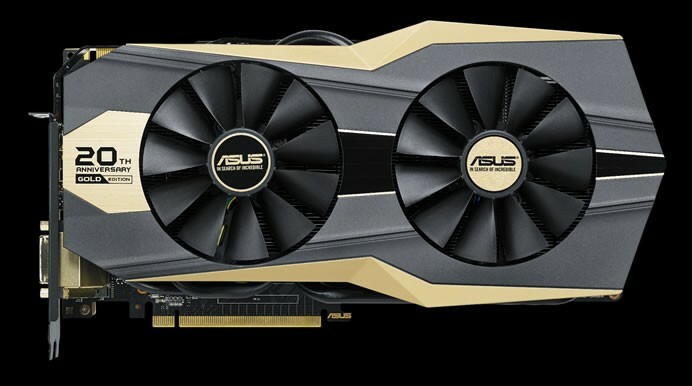 Asus is releasing the GTX 980 Ti version for the 20th Anniversary Golden Edition to celebrate 20 years of making graphics cards. This will be the last chance to get the limited edition gold card. 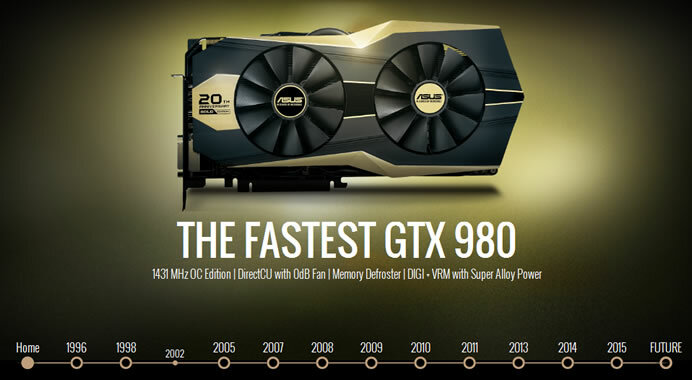 It is not just a GTX 980 Ti in gold, this is the fastest GTX 980 Ti on the planet – even without liquid cooling! Users can buy it, with the GPU base clock set to a whopping 1,266MHz, and 1,367Mhz for GPU boosted clock! To put that in perspective, that is even higher than the mighty ROG Matrix GTX 980 Ti with a base clock of of 1,216 MHz and boosted clock of 1,317Mhz! This translates to 22.1% more performance in Grand Theft Auto V and 20.8% more frames per second in Witcher 3 when compared to reference! Advanced features such as Memory Defroster for LN2 overclocking, color-coded Load Indicator to display GPU load level, and Safe Mode for instant VBIOS reload are all onboard. DirectCU II with 0dB fan technology provides complete silence for general use, while being 30% cooler and three times quieter than reference during more intensive gaming. Each card is produced using the new environmentally-friendly Asus Auto-Extreme technology, which also makes every card consistently better in quality while increasing overclocking headroom. While Asus has been making motherboards since 1989, since 1995 it started development of graphics cards and innovations to differentiate them in the market.